So last Christmas, I saw Tonia’s picture on Instagram and I knew I had to make these. As it was I made them for my students and my colleagues and they went down a right festive treat. 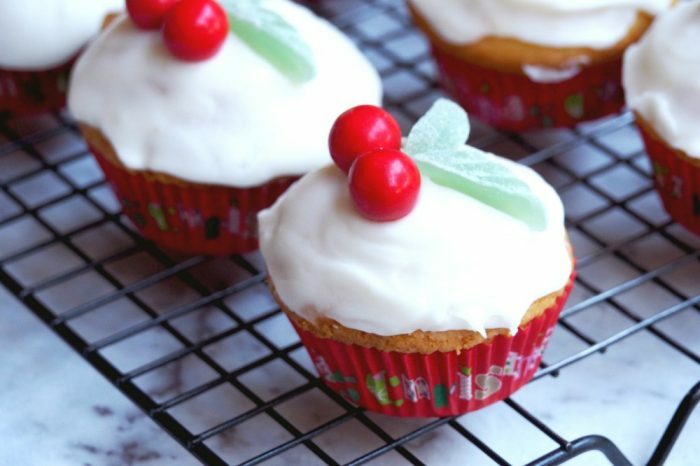 They’re so quick to make, easy to decorate and delicious to eat, that they’re now my official go-to Christmas cupcake. 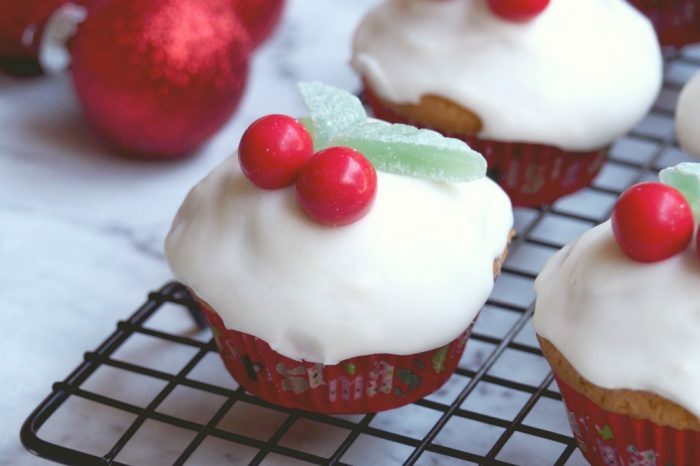 If you have a food processor or a Thermomix you can literally make these cupcakes in minutes! It’s as easy as throwing everything in the machine, giving it a quick blitz and then chucking those cupcakes in the oven. Decorating these cupcakes really is child’s play just remember, those spearmint leaves are chunky buggers, so remember to slice them in half to make them slimmer before you start icing. I like the icing a bit thick so it doesn’t run off the edges but if it’s too hard to handle simply dip a teaspoon in hot water and gently smooth the icing over the top of the cake. 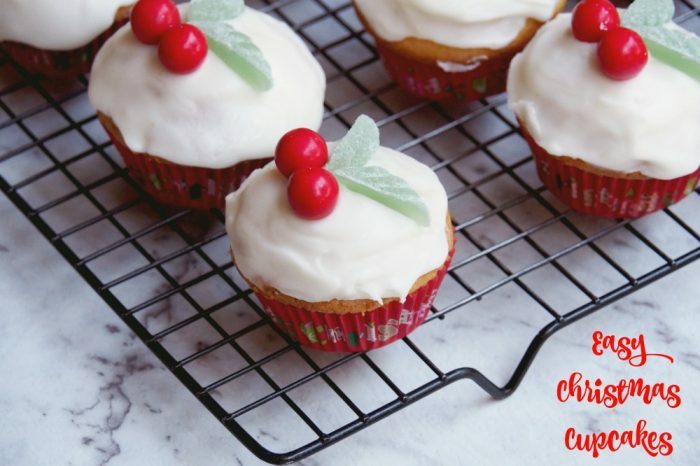 This recipe is easily doubled, freezer friendly and can be made a day ahead, so it’s perfect for parties or when you want to cupcake a crowd! Talking of feeding a crowd, I recently took these for dessert (AKA Cake Buffet) at one of my regular stints as a lunch lady at the Asylum Seekers Centre. I don’t drive so always transport the food on the train with my trusty nana trolley and in this case, my trusty cupcake carrier. These cupcakes attracted a lot of attention on the streets and railroads of Sydney, let me tell you. On the train, a group of mature ladies, cooed over my cupcakes and asked me if I had used marzipan icing. They were pleasantly surprised when I told them that this is one minute icing that you can make with icing sugar, water, a teeny tiny bit of butter and a bowl and a spoon! As we’d just met, they didn’t know that I come from the Lazy School of Baking. On the streets of Newtown I passed two homeless people who eyed off my cakes and said how nice they looked. I didn’t have free change but I did have free cakes which I was happy to share and they were happy to receive. As I walked to the centre, almost everyone who passed complimented these cupcakes. They’re like edible conversation starters! Do you talk to strangers too? What school of baking did you graduate from? Pulse while adding the milk, dropping it down the funnel one tablespoon at a time, until you have a smooth dropping consistency. Bake for 15-20 minutes until golden and springy and when a skewer is poked in it comes out clean. 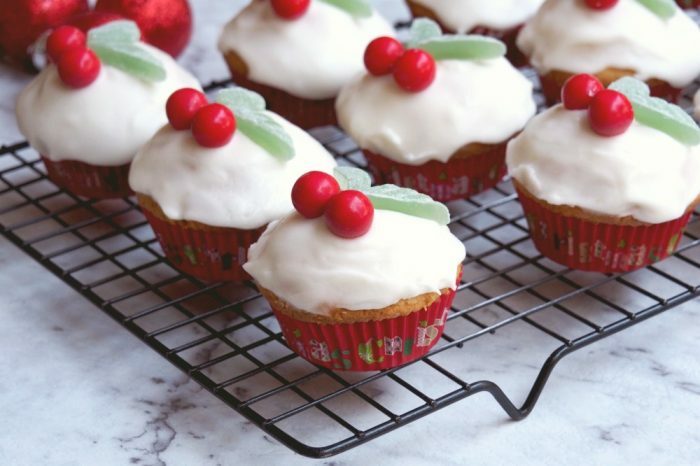 To decorate, put the icing sugar in a bowl, add the butter and gradually blend in the warm water until you have a fairly stiff icing. Spoon over the top of the cakes and decorate with sweets. You want it to be spoonable, but not too runny that it will dribble off the cakes. 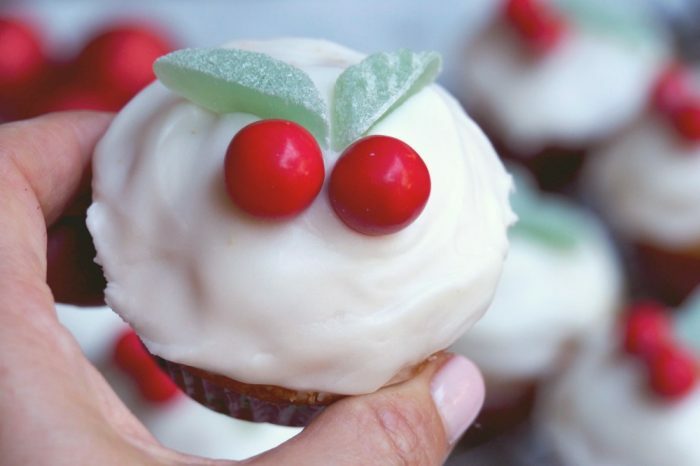 Spread some over each cake and decorate with 2 leaves and a 2 red M&Ms. Place all the cake ingredients except the milk into TM bowl and mix for 15 seconds on speed 6. Scrape down base and sides of bowl. Add the milk to TM bowl and mix for a further 15 seconds on speed 6. Immediately transfer the cakes to a cooling rack and allow to cool completely before decorating. To store… Cakes can be made a day ahead and stored in an airtight container. Uniced cakes can be frozen for up to 3 months.